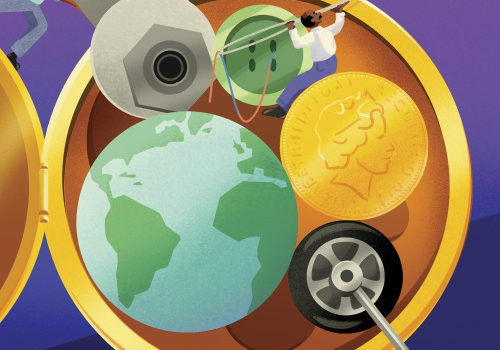 Going circular: The next industrial revolution? The benefits of recycling, reusing and re-manufacturing have been promoted for years. But today, the practice has evolved from one of environmental responsibility to a model for the future of industry and world economies. It’s called the “circular economy” and is viewed by many as the next industrial revolution. The circular economy aims to almost eliminate waste by using products, parts and raw materials for as long as possible. Proponents see the model as having tremendous global advantages, offering a solution to population growth, dwindling natural resources and climate change. Researchers and scientists view it as an absolute necessity, as elements, including gold, silver and tungsten could be exhausted in the next 50 years. Other resources, such as crude oil, are getting harder and more expensive, to extract. Commodity prices are increasingly volatile and environmental degradation is impacting the food supply. Bringing the circular economy to reality will require the reorganisation of how the world produces and consumes. Changes will include designing products to last longer, and in a way that allows raw materials and components to be stripped out when the product has reach the end of its service life. Using renewable resources, reusing and recycling excess resources, and buying and selling services instead of products would also be standard procedure. Leading business and industrial leaders are already buying in. French automaker Renault, fashion retailer H&M, and telecommunications giant Vodafone have introduced “circularity” into their business models. Other companies are sure to follow. Could your organisation benefit?